Yes, I think that out of the entire list, the only thing that really matters is that Ella Bella has an entire month dedicated to raising awareness for Down syndrome. That rocks. We need more awareness. Not just for the general public but for us, her family as well. Here in Ella Bella world, we get so caught up in how adorable she is, we tend to forget that we need to focus on our sign language lessons with her, our reading on her development, our commitment to the Down syndrome community. October is her month. October is my month to get my goals on track. I also decided that I am committing to 31 for 21. 31 days of blogging for Trisomy 21. I am going to do it. I am not alone, there are lots of great parents who are doing it and well, I am sure you all can't wait to see what I have to blog about for 31 days straight. On day 20, you might read about what I made for dinner and who I flipped off while driving, but this 31 for 21 thing is a real mission that has been going on for many years and I want to be part of it, so starting tomorrow, it's on. 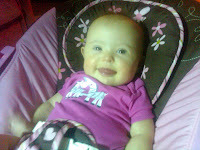 I agree that we do get caught up in how adorable is!!!! Please count me in on learning sign language this month. Are we doing the buddy walk for Down Syndrome? What can I do this month to help you and your commitment to the Down Syndrome community? 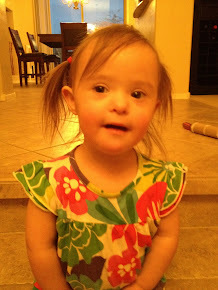 I look forward to reading 31 days of blogs about Ella Bella and Down Syndrome. I am taking the challenge too! Had to laugh when you said near the end you might post about dinner or who you flipped off that day, ha ha, thats what my posts may sound like by the end of the month too! I look forward to reading all about Ella this month!